It is the expansion pack of the acclaimed naval war games "Fleet Combat HD", Fleet Combat Zero : Rise of the Empire HD! Throw away the illusion, ready to fight. Guarding imperial wars begins from the sea. The time era naval defense that takes the ocean as the stage must give you a unique experience! Are you tired of the Defense games that towers never move? Are you bored with those games that you always win? We players call for a Defense Revolution, and the revolution has come! 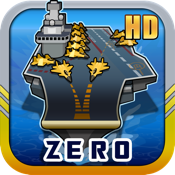 The story took place before four years of its predecessor – Fleet Combat HD. It talks about the process to a powerful Incubus Empire.In 2012, the doomsday befell as foretold. Soaring sea level flooded the land, destroying all countries in the world. The survivors later established the fleet metropolises and their political systems. However, the new peaceful life didn't come. A world war, called as the "Crysis War", broke out. The world became chaos again. Incubus Empire which was located in Asia put forward the "East Asia Federation" Plan to prevent the invasion of the Spes federation that has the growing military strength. The core thought of this plan is to incorporate all of the federations to form a federal superpower and achieve coexistence. For this, the emperor sent his strongest fleet – Rex Fleet joined this war. 1.There are the grand world map, the attractive blue sea, the different styles of islands and the various elegant warships. You will feel immersive! 2.Cool missile salvo and pervasive fighter fleet must make you unforgettable. 1.15 kinds of the automatic weapons and 70+ kinds of manual weapons. 2.Free combination according to the different carrier abilities and the weapon weight. 3.To structure the Defensive Matrix through using the weapons of the different ranges. 4.To promoting the maximum damage output in an unit time through controlling the cooling time of the weapons. 5.New unique weapons added: DF21 and aceTeam. 1.10 shapes of the enemy warships. 2.In different battles, the enemy warships equipped with different weapons. 3.Various especial fleets totaling 25 kinds. 4.Various soul-stirring battles such as pursuit and attack, breaking through, defensive and so on. 5.The exciting BOSS war is the indispensable elements. 1.All of the weapons can be unlocked and upgraded through getting EXP in the battles. 2.Various warships can be got through using the level starts got in every battles. 3.To get the additional EXP rewards through the battlefield ACE system. 1.The mystery in the open, the grandness in the world map, the enthusiasm in the shipyard, the exciting one in the battles, the intension in the decisive battles, the relieved feeling in the end… There are 6 original songs to bring the top experiences to you!